…well it’s upon me. My first triathlon of the season is Saturday. I love triathlon. I love training. I love racing. But my heart’s hasn’t really caught up to this season yet. I had a rough start to this year, and training and health issues have kept me from being as excited about this race as I should be. I know I’m 100% prepared for this race. I can do the distances in my sleep. I know the course with my eyes closed. Then there’s the swim. 200 meters. No biggie. Except they just filled the Olympic sized outdoor pool last week. Did they fill it while the temperatures were in the 90s a couple weeks ago? No. Did they wait until it was cold and rainy to fill it? Yes. Just for perspective. Think about the temperature of water that comes out of your hose this time of the year. Or that first dip in the neighborhood pool after Memorial Day. Also, typically triathlons where the water temp is under 76º are “wetsuit legal.” But this is only 200 meters. It will take me longer to get in and out of a damn wetsuit than to swim 200 meters. So, I foresee a lot of doggy paddle until I can get my breath under control. I’m taking guesses on what the final water temperature will be at the start of the race. Maybe I’ll make this fun and make a contest out of it. So send me your best guesstimations on water temp for the race. I’ll let you know if my quads enjoyed the pre-race ice bath. Complete a Half Ironman (70.3). Swim in the ocean (not just frolic, like a real swim, perhaps as a triathlon). Run the Louisville Triple Crown. Do real pull ups, unassisted. Witness one of the “big” marathons (NYC, Boston, Chicago, etc.). Witness an event at the Olympics. Bike the Bourbon Trail or run the Bourbon Trail Relay. Play in a disc golf tournament. Master a flip turn in the pool. Play on a team sport. What are your exercise/sports/athletics bucket list items? Now go donate and support Hooping For Hope!! I went for my first run yesterday. Nearly 4 weeks since my last run, since surgery, since my hospital visit. It felt great. It wasn’t my best run ever, but it sure beats out not running any day. I could tell I still hadn’t gained back all the weight I lost in the hospital. That tank top hung off my bony shoulders like I was real marathoner. (Note, this won’t last long, I love food too much! In fact that’s why I run!) I laced up my new running shoes (dear Mizuno, I love you!) after work and hit a nearby greenway. I love running at greenways, because you can just get into the groove of the run and not be interrupted by stop lights, jackass drivers (we have some real special ones here), or uneven sidewalks (when you’re lucky enough to find sidewalks in the city). In other words you can safely zone out and enjoy the run. I decided that my first run shouldn’t be fraught with additional stressors that may make me hate it, and off to the greenway I went. It turned out to be a beautiful day, sunny and warm, and all the rain had moved on to other parts. I started out a little fast, but I was just so happy to be back on the pavement. About halfway through I was starting to feel it a little. Partially from the going out too fast after not running, and partially because I hate running in the evening. I’m so much more of an early morning runner. After work, I’m tired from working all day, have trouble fueling properly for a dinner time run, it’s hot, and air quality is poor in the city. In the end, it was a respectable run. Kept a decent pace, even with some walking on the super steep hills (no need to overdo those right?). 3 miles down. Several hundred more to go! Don’t forget, I’m still Hooping the Half Marathon next month!! I’ve been going on the hoopwalks with the team the past couple weekends (7 miles a day with a hula hoop, and I was worried about running again!). And you can still donate to help out Breast Cancer Survivors here. I’m halfway to my goal. It only costs $40 to make and send a hoop to a breast cancer survivor, and my goal is to be able to send 2 hoops! Hooping Again, Update. Fundraising page now live! Just as I promised, our individual fundraising pages are live. You can go here and donate to sponsor me to Hoop the Half Marathon with Hooping for Hope! All donations stay with Hooping for Hope. 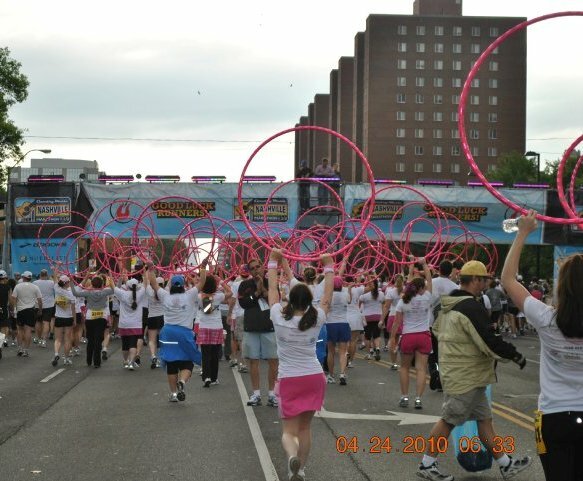 Hooping for Hope is a stand-alone 501(c)(3) non-profit organization that relies on donations to provide free hoops to breast cancer survivors all over the country, as well as hooping classes to local breast cancer survivors. As a 501(c)(3) non-profit organization, your donations are tax-deductible! It only costs about $40 to make and ship a Hoop to a Breast Cancer Survivor, so any amount of donation is appreciated! We accept cash, credit, and checks (payable to Hooping For Hope). The online donation page retains a small transaction fee, so if you can only donate a small amount (and believe me $1 donations are just as exciting as any amount!) we recommend you donate via cash or check to maximize the benefit from your donation under $5. I can take cash or check donations in person, or you can mail them to: Hooping For Hope, PO BOX 68040, Nashville TN 37206, and indicate in a note or on the check that it is support me as a hooper. My mother just before the Philly Half Marathon: I just don’t know how you do it. Mother: No. 13 miles. Running. Or this past weekend with my hairdresser’s assistant. Assistant: How many miles do typically you run a week? Me: During the week about 4-5 miles 2-3 times per week, and then between 7-12 miles on the weekend. But when I talk to my runner and triathlete friends, that’s no big deal. And in fact, I tend to stay on the lower end of mileage compared to others. Since I don’t train for full marathons or full Ironman competitions, I’d rather train smarter than harder and avoid injury. In any case, it’s really hard to shock my fellow athletes with my training. Until I bring up hooping. 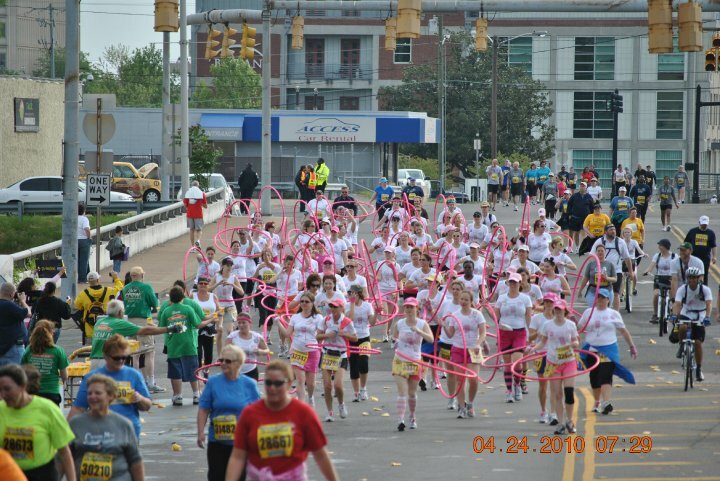 If you remember 2 years ago, I hula hooped the half marathon here in Nashville. Last year, injuries, training, and personal matters prevented me from training. So, I made the decision to train with the hoopers every other year, and provide bike support in the off years, which I did last year. I will not be a trainer again this year, as I will need to focus time and attention on other running and triathlon training. But yes. I will hula hoop 13.1 miles. 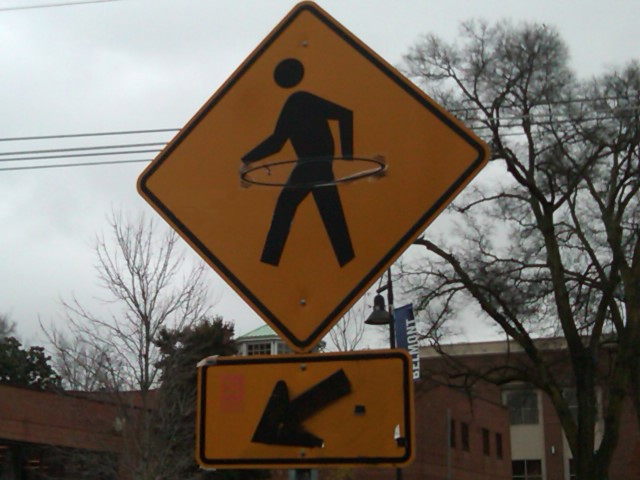 If you thought running 13 miles at once was hard, try walking with a weighted hoop around your waist. But the program Hooping For Hope, makes it worth it. And this year, I have even more inspiration to hoop for the breast cancer survivors. I have a dear friend who is only a year older than me who is going through aggressive treatment for breast cancer. She has agreed to let me hoop on her behalf. And once she has finished her treatment, she can also be a recipient of the Hooping For Hope program. You can also donate to Hooping For Hope and support me to hoop 13.1 miles (all at once!). It is a tax-deductible contribution, too! You are always welcome to donate to Hooping For Hope here and leave a note it is to support Hooper Kelly R. And soon they will hopefully have the individual donation pages up as well and I will update the blog here with that information. UPDATE: My individual donation page is up here. Or if you know me in person, you can always hand-deliver the donations and I will get them to Hooping for Hope! NOTE: All donations stay with Hooping for Hope. Hooping for Hope is a stand-alone 501(c)(3) non-profit organization that relies on donations to provide free hoops to breast cancer survivors all over the country, as well as hooping classes to local breast cancer survivors. Well, I made it through this year’s 46 Day Challenge. There’s a reason it is called a challenge. It’s a challenge to keep up with the exercise on a daily basis, even when you’re sick, busy, or out of town. It’s a challenge to “make” time rather than “find” time. You challenge yourself to new physical and mental limits. Or you just challenge yourself to try something crazy, like a triathlon. For the last weekend of the Challenge, I was out of town for the holiday. While travel usually makes it difficult to exercise, I still found time to run on one day and because of where we went for vacation (more on that in an upcoming post, here’s a hint…the happiest place) there was a LOT of walking involved. I mean a lot. I almost regretted going for that run on Saturday morning. I have some well-worn sneakers now! Also, remember how I hooped the half marathon last year? Well, I wasn’t able to participate in the training this year, but tomorrow is the half marathon. I will be on bike support with the hoopers! Getting in my biking training for the triathlon and supporting a great cause and group of women at the same time! Here is my final progress. So, how did you do? What has been your biggest challenge?